I made them. Me. In my current mental and emotional state of nervous wretchedness. And I’ve even started referring to myself in the plural first-person. And writing in fragments. Like Yoda, I is. But I still managed to make these without starting a local apocalypse. So. That’s how I know. Some days I almost wish that was a joke. On the morning I baked these, I was not looking forward to baking. I had been in my brand spankin’ new apartment for exactly 2 weeks, gone through about 5 months’ worth of groceries and pantry items in that time to ‘fuel’ my studying brain, and had a mock exam for these coming up in 5 days. You could hardly find a less happy camper if you walked barefoot clear across the Alps in the middle of January looking for one. And the very last thing I wanted to do five days before my mock was trip into the precarious kitchen to bake instead of read about Romantic Irony, and to fuel my tummy pooch wayyy more than my noggin. And then the photographs. And then the editing. And then the inevitable snacking. Ugh. But I had to make something as a thank-you for some friends who had helped me with moving, and so when I fumbled my way across Tieghan’s post from Half-Baked Harvest advertising that these bars were delicious AND idiot-proof (her phrase! Isn’t it such a hook? ), I could almost hear the despair melting away like so many sunbathing snowmen. And I have wonderful news: these bars are really, truly, honest-to-madness idiot-proof. 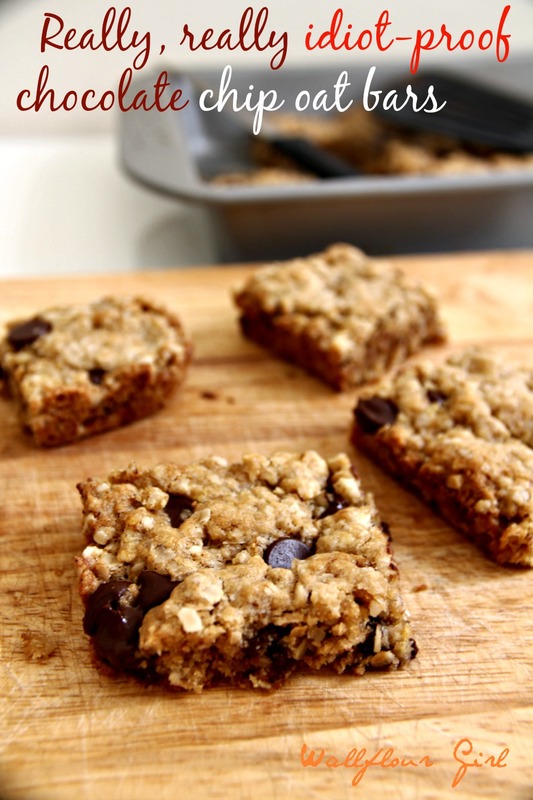 They’re perfectly chewy, crumbly, oaty, chocolatey, cinnamony–and did I mention healthy?–all at the same time. Oil only, folks–no butter here! Did I mention that my friends could not stop eating them and positively raved about them after the pan had been licked crumb-clean? And all at no additional cost to my sanity. I love it. Compared to making traditional bar cookies, these take zero thought and significantly less active time to throw together. Glutens? Don’t mind them. Overbaking? Not a chance. Even the dishes are easier to do after whipping a batch up, since the thick oat-y batter barely leaves a smidge on your mixing bowl! (And thankfully for me, this also meant I didn’t ‘have to’ lick the bowl afterwards, which saved me from another drastic snacking spree.) Yep, these were bars to feel good about when I had very else little about which I could feel good. The good news is that today is the fifth day since I made these bars–and I can satisfactorily report that I took my first mock exam this afternoon! It was an extraordinarily nerve-wracking experience, but after we finished, it felt surprisingly reassuring to know I survived it…and with affirmation from someone who was not the second voice in my head, too. If you’ve ever read or listened to The Last Lecture, Randy Pausch says that the lead-up to his qualifying exam was the second-most stressful period in his life. The first was leukemia. I can’t corroborate that last statement, thankfully, but I sure as heck cannot wait for this exam to be (hopefully successfully) done next month. Lightly adapted from Half-Baked Harvest. Preheat oven to 350 degrees. Lightly grease a 9×13-inch baking pan and set aside. Mix in your chocolate chips. Sha-bam! Done. Shove it all in your prepared pan. Like, evenly and stuff. Sprinkle more chocolate chips on top if you feel like it, because you’re a grown-up and don’t let anyone tell you otherwise unless you’re not one, in which case pretend you are one while you’re making these. You can wear shocking red high-heels in the kitchen to facilitate this process. Bake in preheated oven for 20-25 minutes, until bars are lightly golden on top and they seem just slightly doughy–then pull them out and let them cool on the stovetop for at least 30 minutes. Cut these crumbly, chewy babies into squares, or just attack them with your fork. I did. Leave Ala a comment below to let her know that she doesn’t sound completely idiotic (yet). Enjoy! Achieving a higher sort of artistic grace by acknowledging the chaotic irreconciliability of the universe–yes, I guess you could say that of this blog post, haha! I doubt you could compete with some recent idiot things I’ve done recently, but I bet you’d love these anyway! I have cinnamon crazy folks so I increased to 2 tsp. Thank you. Glad you loved it and to hear about your adjustments, Pam! I love dump recipes, too! I can’t rave about them enough–thank you for reading! I can’t wait to try the recipe, but what really tickles me is your writing!! and photos!! Thanks for making me laugh. repeatedly. Nicole, you are so sweet–I love reading all comments, but writing is my favorite part of blogging so it tickles-me-mahogany whenever a lovely reader like yourself mentions it. Thanks for stopping by and making my day–hope to see you around soon for more laughs! Or two or three–why not, right? You betcha, Christina–thanks for stopping by! Good luck on your exam!!! Tell me about it–I was so sleepy I almost reached for the (hot) oven rack with the hand that was NOT holding the oven towel yesterday….thanks, Erika! Oh, my kitchen is beyond order atm–think vortex…Thanks for stopping by and reading, Kate! P.s. Your “just add cornstarch” line made me smile. Congrats on the new domain!! I’ve been wanting to change my name but I am TERRIFIED! I am so beyond impressed by your visual recipe index. HTML code and I aren’t that good of friends. On a side note – these bars look fabulous! I am obsessing! Pinned! These were extremely bland and dry. No flavor whatsoever, and not even remotely appetizing. I followed the recipe to a t, so I don’t know if I did something wrong, but they were awful. I’m never making these again! I just made my second batch! This recipe isn’t super sweet or rich but definitely satisfying. 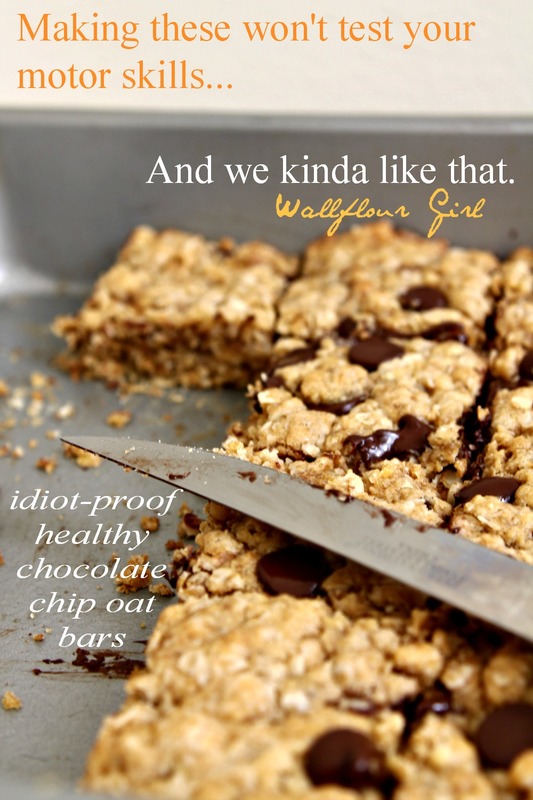 I will use this whenever I want oatmeal /chocolate chip cookies in the future. Thanks! I’m so glad you like them as much as I do, Margery! Totally satisfying in all the right ways–I agree completely. Have a fantabulous rest of your week! These bars are great! So easy to make and delicious that I’m making them again to appease the security guards at work! They’ve been asking since I brought them in a few weeks ago. Thanks for the recipe! Hah! You serve these to the security guards at work? That’s such genius! It sounds like it’s all for a good cause, then. I’m so glad you love ’em–send me a batch next time you whip ’em up, eh! Holy moly. I made these today. Super easy, very tasty, very filling. Good stuff! Great news though, they’re so good on my first attempt that I’m going to eat them every morning with my tea (If I get to them before the Hubby), and I’m very willing to make another batch in the near future! Allie–first off, I’m so glad you got to try these, and that you and the hubby enjoyed it! Thanks for all the added tips–I never seemed to encounter any of the issues you mentioned, but it’s great you’ve noted them in case other folks ever need to troubleshoot. I LOVE detailed reviews from wonderful folks like you who have tried my recipes! All the best, Allie, and many more batches to you! Loved these. Just what I was looking for this morning! Super yummy! The pan may or may not ne 1/4 gone since taking them out of the oven 2 hours ago. They are good with coffee, milk, or tea. Maybe I should continue these taste tests throughout the day to see what else they may pair with in such nice ways…. 😉 Thanks for posting! Oh, so glad to hear you loved it! Test, test, and test again, I always say…and if you DO come up with any earth-shattering combos, be sure to let me know! 😉 I’m always down to try new things! This is my second attempt. I used to buy the oatmeal bars from the supermarket but these are just delicious and a much cheaper option. My son does not have a sweet tooth but he likes these too. And yes, so simple to make and quick too. So sooo glad to hear it, Razia! Seriously, I cannot get enough of these bars. Cheers to a third try, and a fourth, and a billion more! I just made these- they were super easy and sooooooo good! If you don’t love them then you must have left something out because these are amazing! Hey, theses are delish but super crumbly. Anything to do/add to make them hold together better? I’ve made these 4 times as of tonight, and they’re perfect every time! If you want them softer, go light on the flour and oats, or add more flour/oats if you want them more solid. 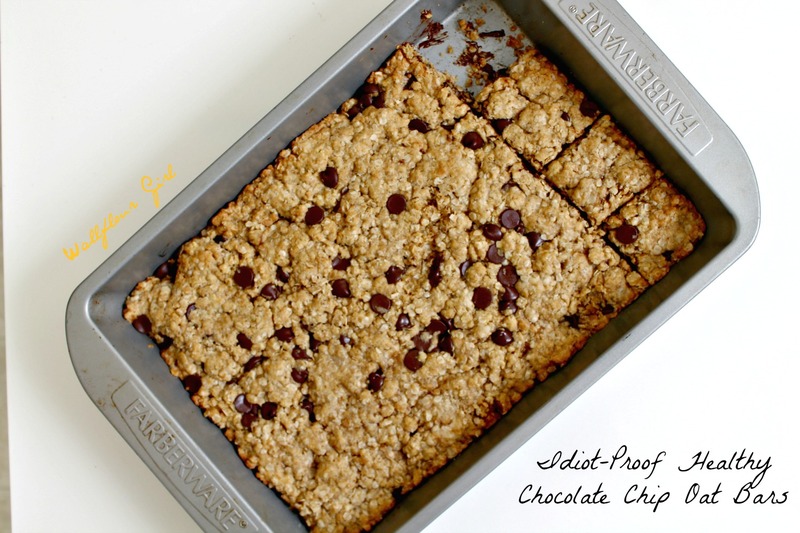 I also tend to drizzle chocolate over the top, but you really just can’t mess these up! Thanks SO much for your feedback, Emma! I’m so glad these worked out for you, and those suggestions (esp the chocolate!!) sound absolutely amazing. Have a great V-day weekend! Great easy recipe! Just would advise to NOT use canola oil ever as it is the worst GMO highly processed food ever. Coconut oil worked great and is healthy to boot! Love your bars and make them often. I add walnuts and sometimes make a little frosting with 1/2 cups melted chips, 2-3 T. Peanut butter and powdered sugar (enough to make spreading easier). That’s GREAT to hear–thanks for taking the time to say so, Ann! Wishing you lots more happy baking–love love love the frosting idea! 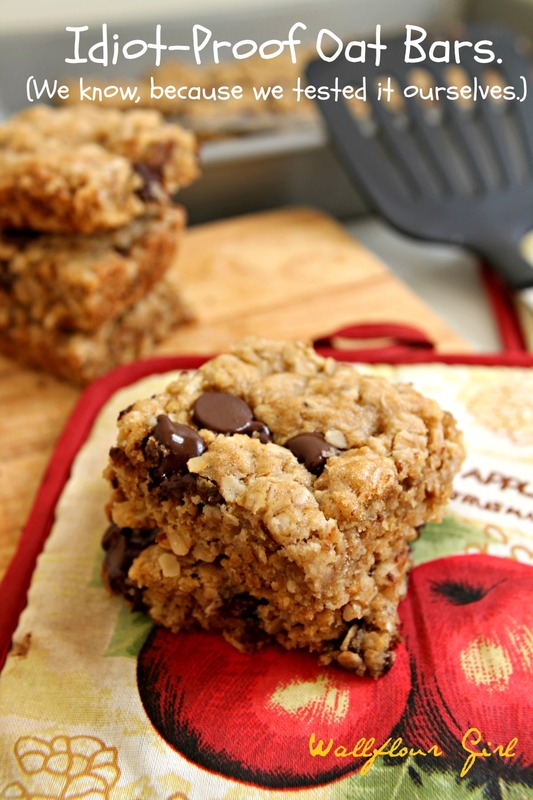 these looks delicious and i always love when i can add oats to dessert, especially when there is chocolate involved! This recipe was so fun to read. My 11 year old daughter and I were trying to find a “healthy” bar recipe. She loved the part about “acting like a grown up”. We’re excited to read more of your posts! Haha! I’m so glad you two had a blast making this recipe together, Deborah. It’s one of my favs <3 Can't wait to chat again soon! Love your recipes, but maybe I am just a teeny bit of an idiot…I can never find a print option for your recipes. What am I missing? Hi Monica–so glad you love ’em! I am currently in the process of reworking much of the layout for this site, meaning that older recipes (such as this one) aren’t currently enabled for printing, though my newest ones are. I have, however, updated this particular recipe now for printability–you should see the “Print” button next to the new recipe format now. 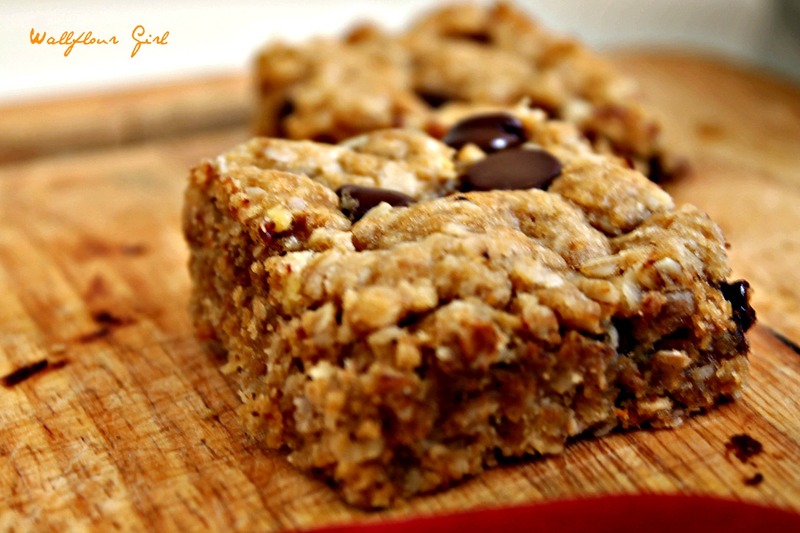 Hope that helps you on your way to making these amazing bars! That’s awesome! Thank you so much.